The new director of education and engagement at the International African American Museum plans to do a lot more than guided tours. Brenda Tindal is the eighth full-time staff member of the museum, which is set to open in downtown Charleston in 2020. As staff historian at the Charlotte museum, Tindal worked a few blocks from the riots that broke out after a city police officer shot and killed Keith Lamont Scott in September 2016. As peaceful — and at times violent — protests shut down some streets for days and the mayor instituted a curfew, Tindal and other museum staff felt they should respond. It took about three months for Tindal’s team to curate and install a new exhibit, “K(NO)W Justice K(NO)W Peace,” which traced the history of racial injustice and progress in Charlotte and the country at large. The museum also began hosting standing-room-only town hall discussions on racial justice and policing. These eventually morphed into the Breaking Bread forum, which brought Charlotteans together over cornbread and collards to talk about their differences. “People didn’t walk out agreeing with each other, but they heard each other,” Tindal said. When the exhibit launched, it featured artifacts from a history that was recent and raw, collected during and after the city’s unrest. On display were a gas mask, a Charlotte-Mecklenburg police officer’s boots, a local activist’s high-top tennis shoes and “a tear gas-stained oxford button-up worn by attorney Touissant Romain,” according to a paper Tindal published about the exhibit in The Public Historian in February. 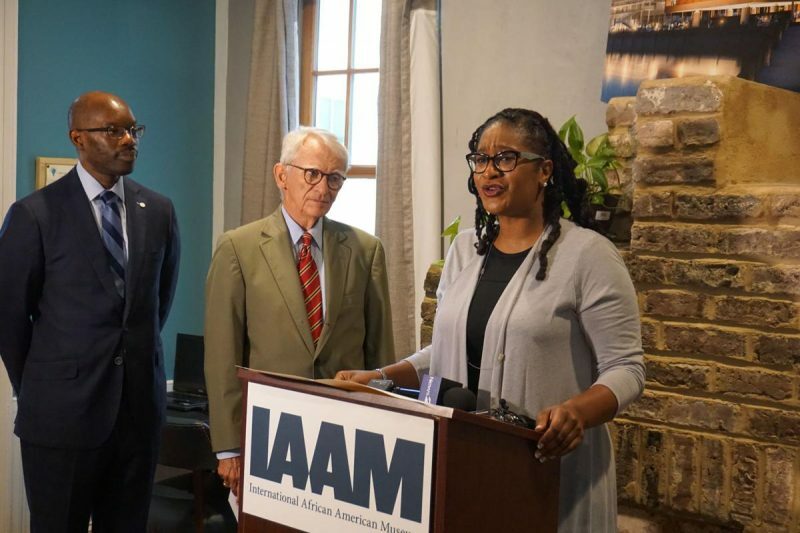 Tindal brings 15 years of museum experience to the IAAM, which is nearing the end of a $25 million private fundraising campaign and will be built at the historic site of Gadsden’s Wharf, a major entry point for enslaved Africans. Construction is expected to begin by early next year. Former Charleston Mayor Joe Riley said Friday he hopes the museum’s outreach will change the way history is taught in South Carolina public schools. “When they learn about the Mayflower, they’ll learn about Gadsden’s Wharf,” said Riley, a member of the IAAM board. Tindal said she plans to set up an online clearinghouse where teachers can share lesson plans on U.S. history. She’ll also provide material for teachers to use before their classes visit the museum, as well as debriefing lessons for afterward. She won’t limit her job to grade-school students. As she learned in Charlotte, education is a lifelong process. “History has this way of sobering people so that they’re not caught in this sort of passionate fit in the moment, but really thinking about it with a longitudinal lens,” Tindal said.